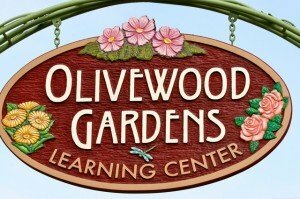 Olivewood Gardens and Learning Center in National City, just south of the city of San Diego, offers environmental education workshops, nutrition classes, and cooking demonstrations. Visitors include students and families from underserved communities, health and wellness professionals exploring the connections between diet and disease, and home gardeners and cooks who want to learn more about the burgeoning back-to-farm-to-table movement. 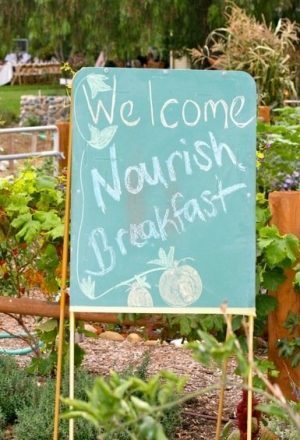 Here, Olivewood Gardens Executive Director Amy Carstensen reflects on a special Nourish breakfast hosted at the gardens, as part of Nourish Day in San Diego. What could be better than gathering around communal tables to talk about farms and food on a misty fall morning? 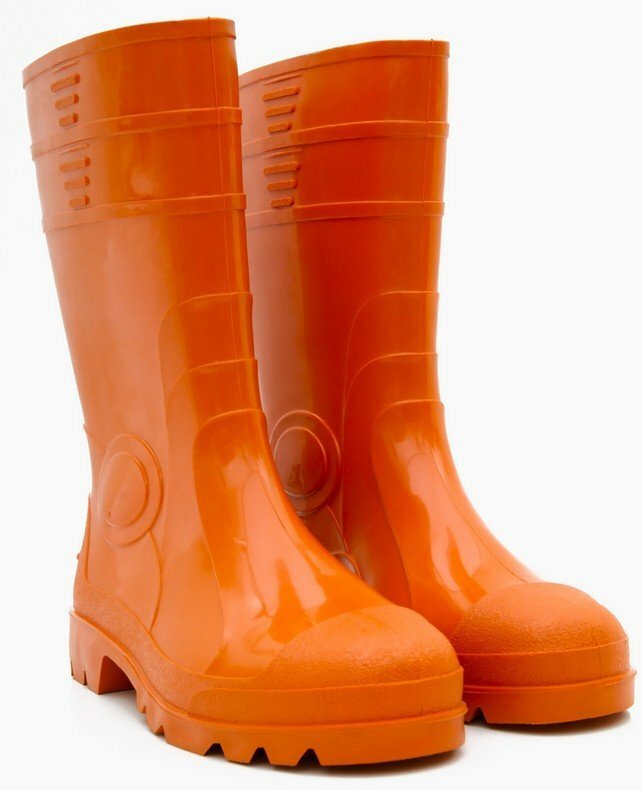 As chickens scratched the ground nearby, 40 “farm-foodies” met on October 21 at Olivewood Gardens and Learning Center to watch a screening of Nourish Short Films, talk with Nourish director Kirk Bergstrom, and discuss the state of American food. San Diego County’s Healthy Works hosted the breakfast as part of its Nourish Day, a local warm-up to National Food Day on October 24. Healthy Works is a component of the County of San Diego’s Live Well, San Diego! Building Better Health initiative, a 10-year strategic vision for improving health and wellness, and combating the toll of chronic diseases such as obesity. 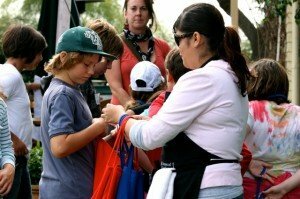 Healthy Works engages residents, businesses, and community leaders in systems and environmental approaches, such as farmers markets, community gardens, school exercise and nutrition programs, bike-to-school and bike-to-work initiatives, and improving land use and transportation. Everyone at the Nourish breakfast at Olivewood had a connection to food: farmers, growers, chefs, restaurant owners, produce distributors, students, professors, nutritionists, farmers market operators, food advocates, policymakers, and local nonprofit program staff, volunteers, and interns. 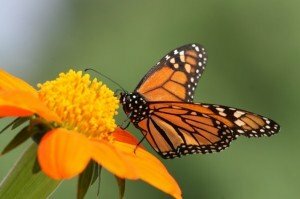 Participating organizations included the International Rescue Committee, San Diego Foundation, County of San Diego, UC San Diego, San Diego County Farm Bureau, and San Diego Restaurant Association. We discussed food system reform at the local level, including recent changes to land use policies throughout the region. San Diego has been updating regulations to allow community gardens (previously rare within the city’s limits) to be developed on empty commercial parcels. As Kirk facilitated, breakfast participants made new friends and connections as they talked about barriers that limit access to healthy food. Part of the discussion centered on expanding support to organic farmers and suppliers. San Diego County has a substantial agricultural sector and is home to more than 6,500 farms—more than any other county in the United States. The county also boasts the greatest number of organic growers in the state and nation, with 374 farms growing more than 175 crops. Yet while San Diego’s mild climate provides a near year-round growing season, bottlenecks in transportation, distribution, and regulation raise costs for small producers as well as consumers. Guests were urged to support the local food chain and “vote with your fork” by dining and sourcing food ingredients from providers who practice or support local and sustainable farming. Later, the participants broke out into small groups and shared stories and cherished memories of food and cooking. 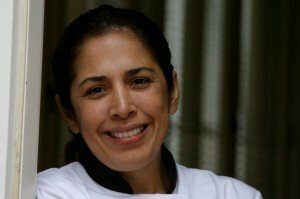 Chef Flor Franco, one of the volunteers who teaches children’s cooking classes at Olivewood, recalled growing up on a farm in Veracruz, Mexico. She was reminded of the days when abundant, fresh, whole foods fed nourishing family traditions built around home-cooked meals. “When I come and cook at Olivewood, I go back to my childhood,” she said. Flor’s company, Indulge Contemporary Catering, provided the mouth-watering farmstyle breakfast. Most of the ingredients were harvested at Olivewood Gardens, from squash and onions to the eggs that were used in the frittatas. After breakfast, participants toured the historic 6.85-acre property and learned about Olivewood’s gardening classes, weekly tours, weekend family days, and weekday field trips, where schoolchildren participate in hands-on, inquiry-based workshops in cooking, sustainable agriculture, water conservation, recycling, and composting. Our hope is that the Nourish Breakfast becomes an annual tradition. There was such an energy and buzz as people shared ideas for working together to support San Diego agriculture and strengthen the local food system. 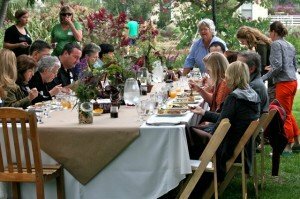 Everyone met new folks who were equally passionate about celebrating healthy, sustainable, local food. It’s true that when you break bread together, you build community.